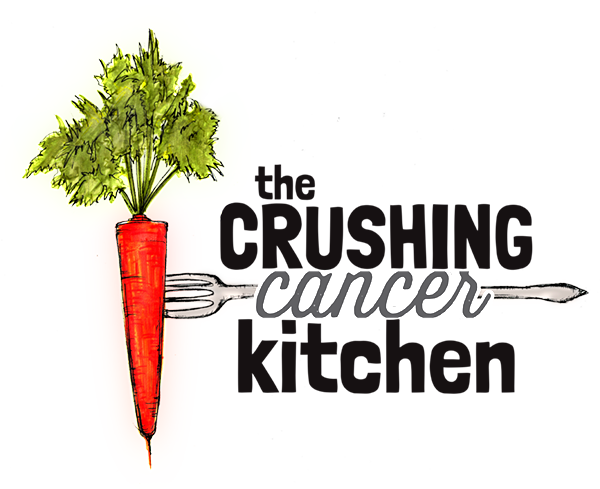 It is hard to be told to cut something out of your diet to benefit your health. Especially if your health is stressing you out and the food is bringing you comfort. 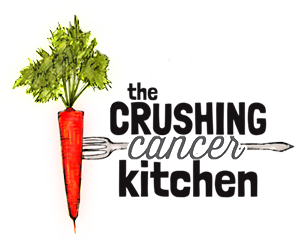 Refined flours, including pasta, are some of those sad cut-out comfort foods when it comes to cancer (and most health issues). If you love pasta in all of its refined flour glory, there is a quirky, fresh and brilliant alternative within your grasp, that I promise you, tastes better than you think it will. 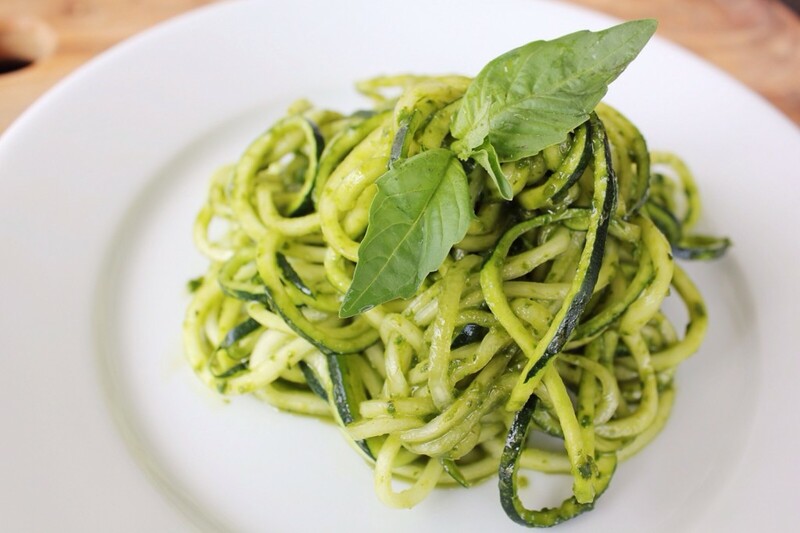 Zucchini noodles almost seamlessly swap out for traditional pasta noodles. 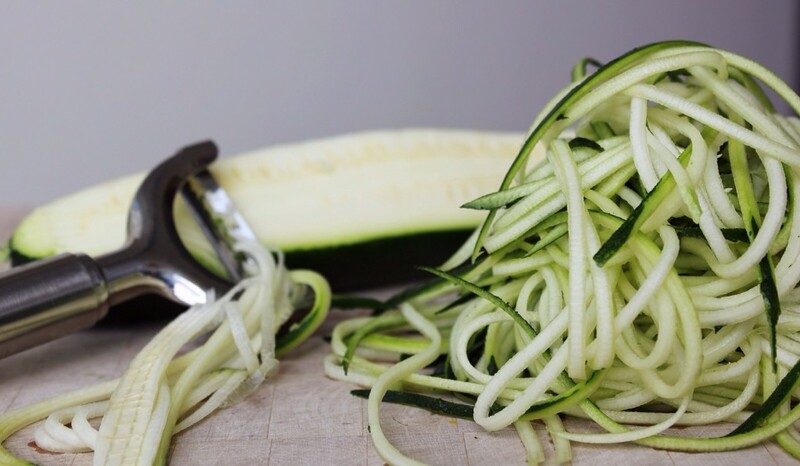 Zucchini, not an overly inspired vegetable in most ways, was possibly put on this earth to create raw, whole-food, unrefined legitimately healthy noodles. Also to make rookie gardeners feel good about themselves. There are many ways to make these brilliant proxies come to be. A peeler is the easiest noodle-making tool for small batches (less cleaning). A regular vegetable peeler, used to peel the zucchini all the way down to nothing, will give you a pappardelle–style noodle (fat and flat). There are ‘julienne peelers’ out there too, which you would use if you want more of a spaghetti-style noodle. They aren’t perfect, but they work pretty well on zucchini, which is on the soft side, as far as vegetables go. The vegetable ‘Spirooli’ or ‘Spiralizer’ is the juggernaut of the faux noodle tool world. 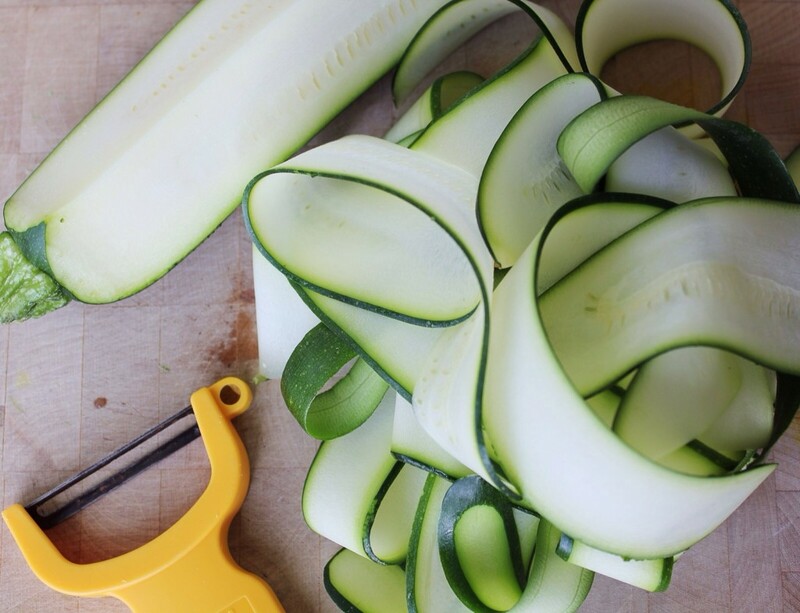 It twirls the zucchini around, coaxing out Rapunzel-quantities of luscious, curly, zucchini noodles. It’s actually an amazing thing to behold, all of that beautiful goodness from a forgotten, underappreciated vegetable. It makes me want to buy another one just because it deserves a friend. They are relatively inexpensive too ($40-$50). 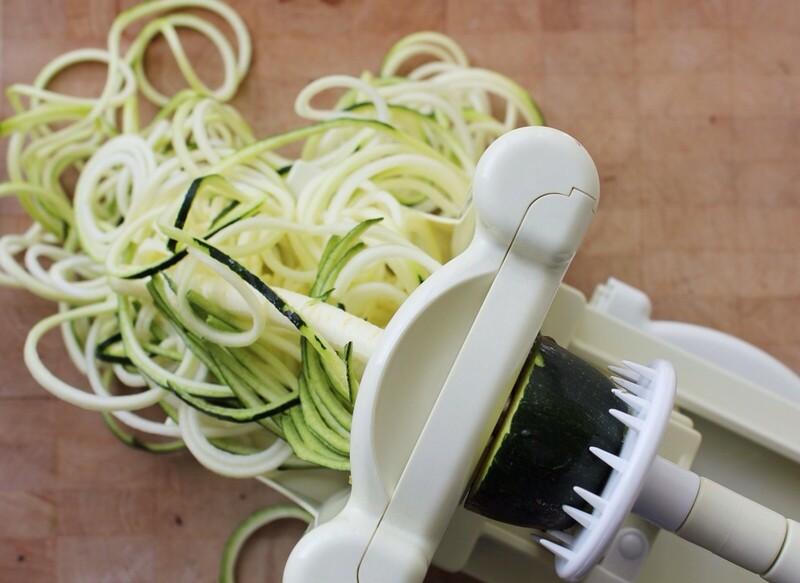 You don’t cook zucchini noodles, they stay raw and you toss or top with sauce. By leaving them raw, they hold together and keep their almost perfect al dente texture. If you add your sauce to the them as they are, they will release a lot of water, making things a little bit soupy. You can counter this by gently over-reducing your sauce so that extra moisture will be welcome when you toss them together. Or you can sprinkle some high quality sea salt on the raw noodles (before adding any sauce) and mix them around well. Let the noodles sit in a colander for 10-20 minutes and then gently squeeze the water out. They will get limp, appropriately, like cooked pasta, and you won’t be in danger of watering down your sauce. If you are pouring your sauce on top, make sure it is hot enough to heat up the room temp noodles. If you are using a raw-style sauce (like pesto), warm the noodles in a sauce pan very briefly with a small splash of water, just to knock the cool out of them, and then add the pesto. If you have a dehydrator, it can also be used for heating at a low temp, keeping your meal enzyme-rich. This is perfect for if you are in a hot climate and don’t mind your pasta less than hot. 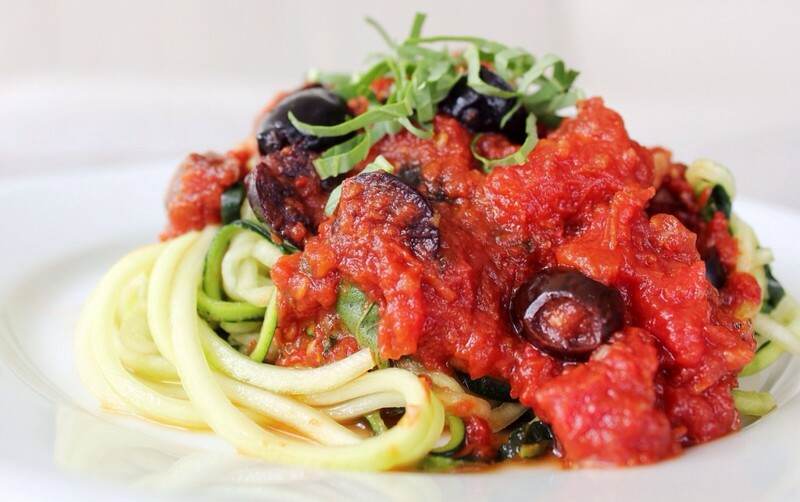 If you have never tried zucchini noodles, it may seem like a strange concept, but you simply must try them. They are inexpensive, easy to make, less work and dishes than boiling pasta, still pretty comforting, and most importantly, keep us away from the blood sugar-spiking, cancer cell-feeding refined carbs. Start by cutting out your regular (whole grain, gluten free) noodles by half, and slowly add more and more zucchini noodles until you get sick of doing the dishes for both styles, and then it’s all zucchini all the time. And just like that, spaghetti is back in the picture!